CIRCA 1918 - A war-torn French town is shown; French Army engineers begin work on repairing a demolished bridge. hd01:32CIRCA 1918 - Allied soldiers go through German equipment and clothing after the St. Mihiel Offensive in France during WWI. 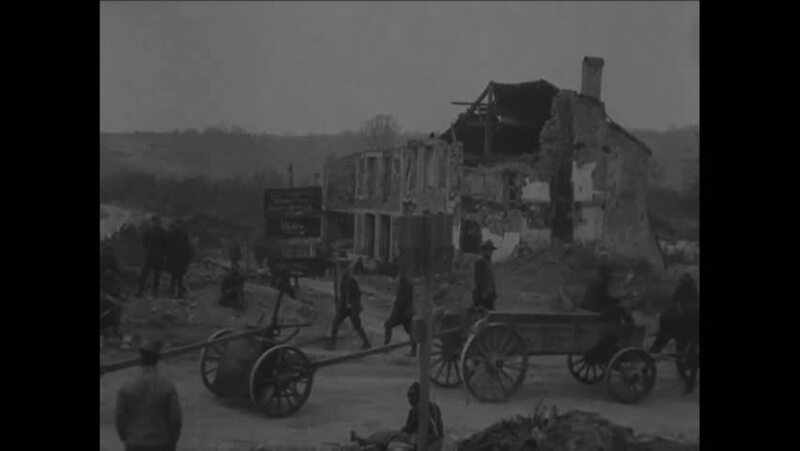 hd00:45CIRCA 1918 - Soldiers show tears and a pole is slipped into a hole amidst ruins in France in World War 1.
hd01:13CIRCA 1910s - A camouflaged railway gun is fired and 52nd and 53rd Coast Artillery Regiments pose in France in World War 1.
hd00:11TRONDHEIM, NORWAY, JANUARY 2014 Aerial drone view over Nidarosdomen cathedral in Trondheim; Norway. hd01:33CIRCA 1929 - Albert Bren films his wife and daughter as they explore a flower field and go for a swim. hd01:31CIRCA 1950s - A man looks forward to relaxing after getting home from his graveyard shift, but is immediately put to work by his wife.